Before installing the first Windows Server 2008 R2 domain controller (DC) into an existing Windows 2000, Windows Server 2003 or Windows Server 2008 domain, you must prepare the AD forest and domain. You do so by running a tool called ADPREP. ADPREP extends the Active Directory schema and updates permissions as necessary to prepare a forest and domain for a domain controller that runs the Windows Server 2008 R2 operating system. You must make a system state backup for your domain controllers, including the schema master and at least one other domain controller from each domain in the forest (you do have backups, don't you?). Also, make sure that you can log on to the schema master with an account that has sufficient credentials to run adprep /forestprep. You must be a member of the Schema Admins group, the Enterprise Admins group, and the Domain Admins group of the domain that hosts the schema master, which is, by default, the forest root domain. Next, insert the Windows Server 2008 R2 DVD media into your DVD drive. Note that if you do not have the media handy, you may use the evaluation version that is available to download from Microsoft's website. You can also use an MSDN or Technet ISO image, if you have a subscription to one of them. Browse to the X:\support\adprep folder, where X: is the drive letter of your DVD drive. Find a file called adprep.exe or adprep32.exe. 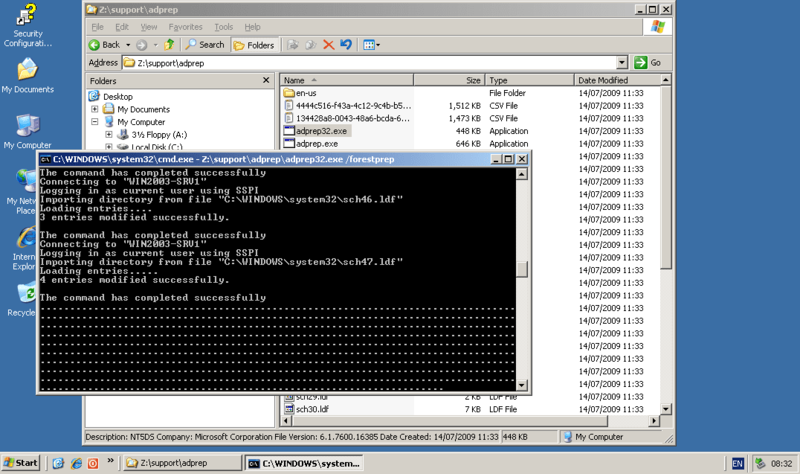 Open a Command Prompt window by typing CMD and pressing ENTER in the Run menu. You will be prompted to type the letter "c" and then press ENTER. After doing so, process will begin. Process will take less than a second. If you're running a Windows 2008 Active Directory domain, that's it, no additional tasks are needed.